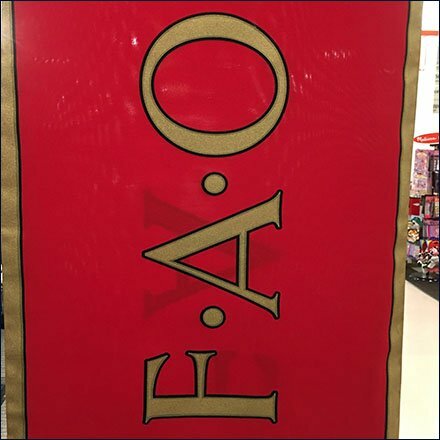 If you host something as grand as this you would surely roll out this FAO Schwarz Branded Banner at BonTon. What retailer wouldn’t give its eye teeth to be affiliated with FAO Schwarz? So a ceiling to floor banner, or two, or three, is the least that would be expected at rollout. Cutting across all sight-lines, it compels attention from all center store. This is a strategy you might be able to use to great effect in any store.